While performing in Waiting on Godot at the Theatre Royal Haymarket, in London actor Patrick Stewart was thrown a bit by a ghostly sighting of his own in the famously haunted theater. During an interval in between acts, he reportedly told fellow actor Sir Ian McKellen that he had been thrown off his game a bit by a spooky sighting. The ghostly figure appeared to be wearing a beige coat with matching twill trousers and was standing just off stage, lingering in the wings. Others working in the theater reported that Stewart was definitely thrown by the apparition and did not appear to be frightened by it, but definitely took note of the ghost. Behold, the giant pitcher plant of the central Philippines, a flesh-devouring hunk ‘o chlorophyll that would make Poison Ivy sigh with romantic bliss as she imagines it consuming her arch-enemy, Batman! This new species was discovered by two Christian missionaries who got lost climbing Mount Victoria. 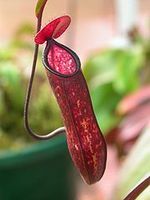 Three pitcher plant experts then set off on a two month journey to identify the new addition to Earth’s Little House of Horrors. During the expedition, they also came across new varieties of pink ferns and blue mushrooms that have yet to be identified.